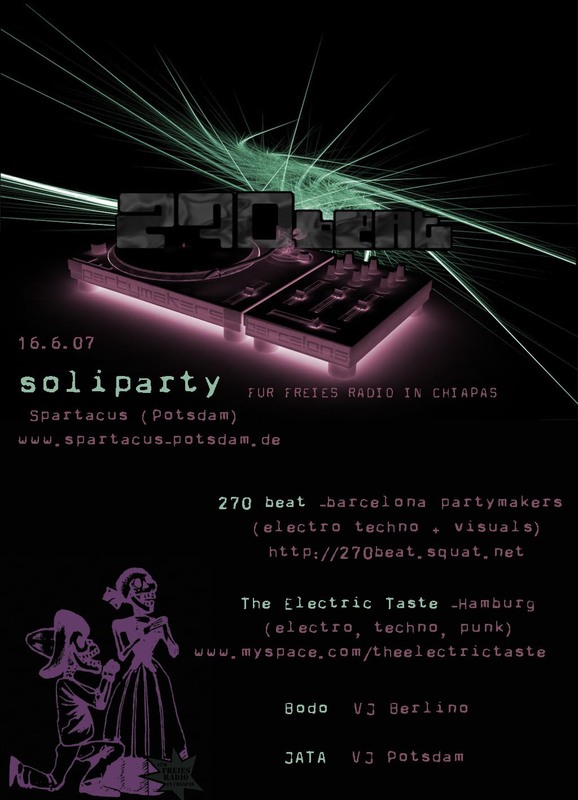 We were the 270beat, a collective of partymakers dedicated to organize benefit parties in squats and social centers. We had a great time between 2006 and 2007, touring across europe, then we organized some more benefit party from time to time, but right now we have to consider this experience as finished. The main 3 prisoners we were supporting (presos 4F) are finally at home, even if they still have lot of money to pay... But the 270beat crew is actually splitted up, spread over lands and seas, while some of us are currently producing music and videos to go on with the party spirit... If you want to know more about 270beat collective, you can read our manifesto in english, french, spanish, italian or german. You can also browse our FAQ sections or take a look at our picture galleries... this web-site will be on-line as souvenir just as long as the squ@t!net webmaster (who gently gave us this space on their servers) will leave it. Thanks again to everybody helped us collecting money for prisoners and having fun at once! After the party, another collective had organized an open-air afterhour on a freshly lawned grass near to the lake. We were a little bit nervous about the weather since the night before it had been raining hard; luckily on Sunday the sun shone all day long and we even had to pick up some UV protection (climate change is a tough reality)! The afterhour party was the first illegal party in Potsdam since a long time, so we didn´t know how the city government and police would react to it. In the end they threatened the organizers with a fine, but people were able to carry on the party until 9pm just as it was planned. From time to time, during the sunday party, we were chilling out by taking a bath in the Heiligensee lake or the connected river... that´s the good side of organizing parties in a small city full of nature! Anyways our suburban spirit is calling us again, so we get moving to Berlin, planning to meet old friends and take some weeks of pure vacation. In one of his few moments of spare time, DJoy Met was inspired to make a small video out of different images taken from our parties. The result is pretty nice: you can download it here. Most of the images are from our last party in Barcelona, that we made a few months ago in Kan Kadena squat, benefit 4F prisoners. (english) On friday first of June 2007, members of 270beat collective inaugurate with a private party the place that hosts all of our sound, light and video equipment. It's an empty factory next Barcelona, rented since a few months. 270beat was involved in renovating this place, and now we have a nice space (supposed to be safer than a squat) to work at the pre-production of our new projects. The party was nice -from time to time it´s cool to make some activity without asking any money to the people!- and everybody appreciated music, videos, lights, but especially drinks and food, almost all night long! (castillano) El viernes primero de junio, peña del colectivo 270beat inauguramos –montando una fiesta entre colegas- el lugar en el que tenemos todos nuestros equipos (de sonido, video e iluminación): una fabrica abandonada en los alrededores de Barcelona, que está alquilada desde hace unos meses. L@s de 270beat nos curramos muchas reformas del local, y ahora disponemos de un espacio (supuestamente más seguro que una okupa) dónde trabajar a la pre-producción de nuestros nuevos proyectos. La fiesta salió muy bien –de vez en cuando mola hacer fiestas sin dinero por el medio!- y todo el mundo disfrutó de musica, videos, luces y sobretodo bebidas y tapas hasta las tantas!